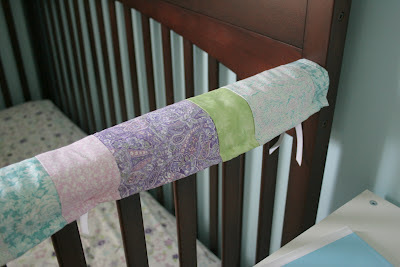 I discovered last week that Piper had been quietly standing up in her crib and chewing up the rails! When Cadence started doing this same thing, we bought some clear rubbery plastic guards that fit on the front rail, and that solved the problem. 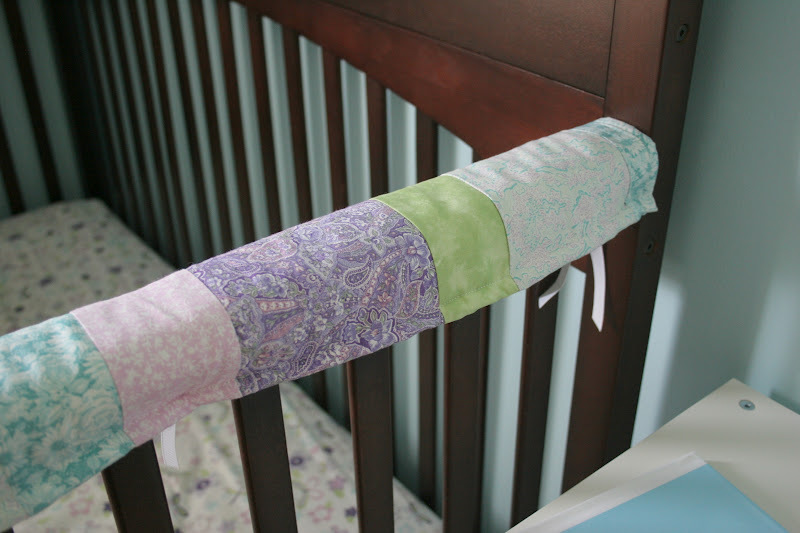 But with Piper, she likes to chew on the sides...anyway, it was time for me to make these fabric crib rail guards. 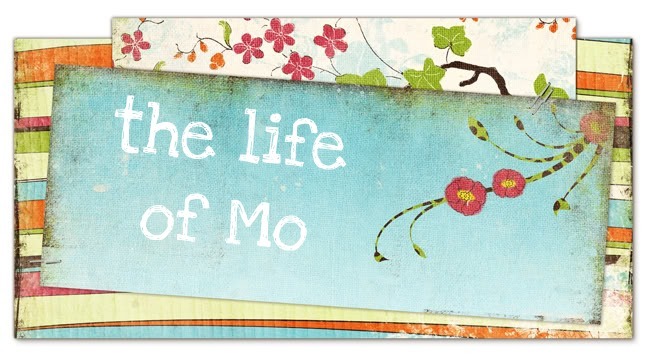 Inspired by this project. 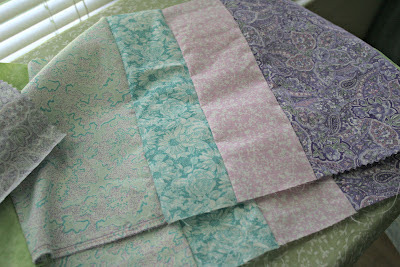 I found a variety of fabric scraps that go with the colors in her room. I didn't have time to get anything new for this project, so I cut up an old crib mattress pad that had lost its elastic to make the lining underneath the pretty fabric. Bonus: it's waterproof if she does continue to chew. I sewed on some thin white grosgrain ribbon for the ties. I found just the perfect amount in my ribbon box. Here's the longview. Hm. 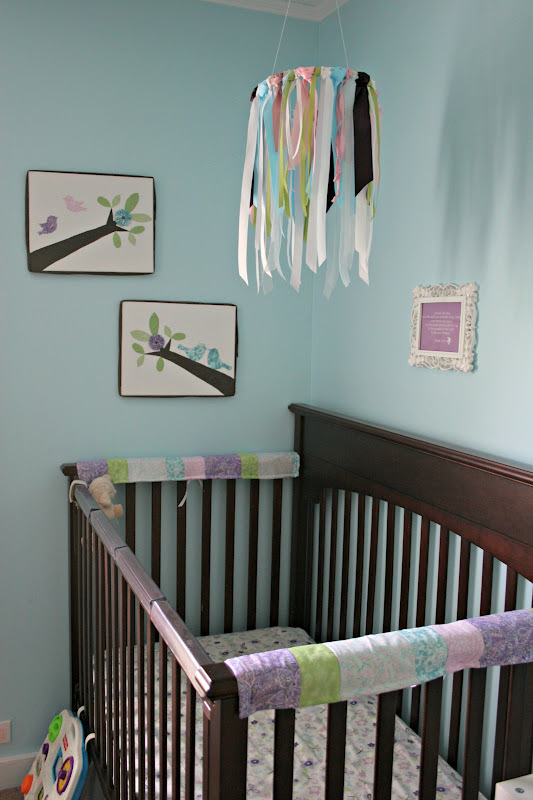 All the handmade stuff seems to have ended up in this corner of her room. 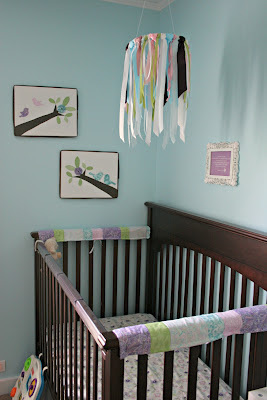 See the details on the fabric bird art here and the ribbon mobile here. Amazing work, reuse of material, and creativity sweet daughter! Very pretty. Love this idea! Great job! You should teach other Mom's how to make this!